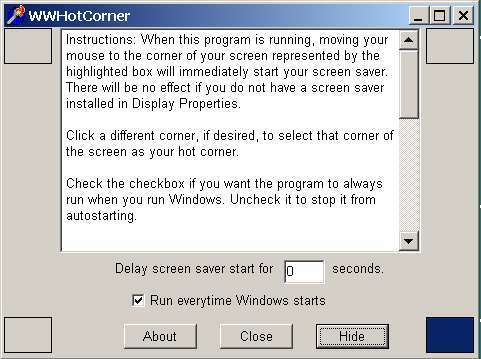 WWHotCorner is a free hot corner utility from Arcata Pet Software for Windows 95/98/ME/NT/2000/XP. The dialog above will show when you first run the program. After that it will always start hidden. To see the dialog again, run the program again while it is already running. WWHotCorner does not use any support files and does not need to be installed. Put it where you want it and run it from there. To uninstall, just delete the program, although if you have it set to Run every time Windows starts you should disable that before deleting. WWHotCorner is completely free, and will never expire.